Olivia Moore is one of the UK’s most innov­at­ive and cre­at­ive viol­in­ists. She works across a broad spec­trum of genres, ded­ic­at­ing her­self primar­ily to jazz and clas­sic­al Indian music. After giving her first per­form­ance at the age of four, she spent her child­hood and teen years mas­ter­ing clas­sic­al music before going on to explore the art of impro­visa­tion. She gradu­ated from the Royal North­ern Col­lege of Music in 1999; B.Mus (Hons) in Aca­dem­ic Stud­ies (2.1). How­ever, at 21, inspired by a jazz summer school at the Guild­hall School of music, she dis­covered the art of impro­visa­tion. 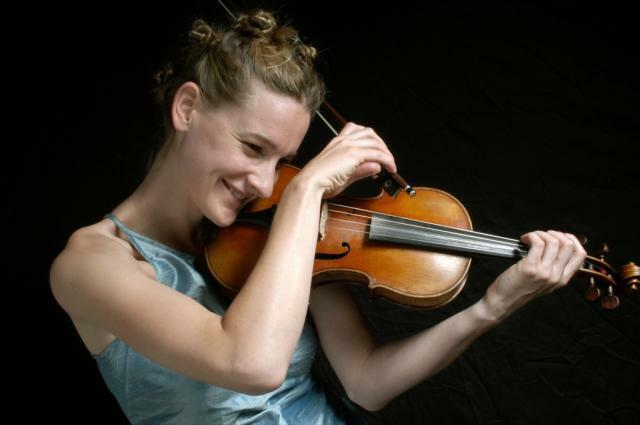 This pro­pelled her into a post­gradu­ate dip­loma at Leeds Col­lege of Music (Dis­tinc­tion in 2002). At Leeds, her curi­os­ity drew her to many dif­fer­ent styles of music. After gradu­ation she spent two years per­form­ing with the Indian fusion band Savateen, play­ing their own ori­gin­al works. High­lights were the Brno Street fest­iv­al in the Czech Repub­lic and at the Mil­len­ni­um Park and Birla Temple, in Cal­cutta. In 2005, she decided to follow her dream by going to India to study with violin maes­tro Kala Ram­nath, which became the first of many visits to the coun­try. Her most recent visit was in 2010. Olivia has played twice at Gla­ston­bury fest­iv­al with fla­menco gui­tar­ist Nick Wilkin­son as well as col­lab­or­at­ing with Graham Clark, Seam­ing To, Kirsty Almeida, Stuart McCal­lum, OdBod Col­lect­ive, Mat­thew Bourne, Giuli­ano Mod­arelli, Glenn Sharp, Suns of Arqa. Her ongo­ing band Unfurl is an innov­at­ive quin­tet who col­lab­or­ate, draw­ing from their diverse influ­ences of Jazz, Indian and Arabic rhythms. They have appeared at Manchester, Marsden, Marl­bor­ough and Brecon Jazz Fest­ivals as well as at venues such as the Bridge­wa­ter Hall Foyer and the Birm­ing­ham Sym­phony Hall Foyer. In 2009 Olivia was one of eight musi­cians in the coun­try to be selec­ted to be a par­ti­cipant of the Ser­i­ous Take Five artist devel­op­ment scheme. Olivia has reg­u­larly since looked to the Arts Coun­cil Eng­land, for help with tour­ing costs and to devel­op music. Olivia has always been inter­ested in com­bin­ing with other art forms. In 2006 she com­posed the soundtrack to a doc­u­ment­ary film for Reli­gious Edu­ca­tion in schools, ‘Buddhist Pil­grim­age: An Indian Spir­itu­al Jour­ney’ (The Clear Vision Trust). A par­tic­u­lar high­light of her career was work­ing with LaMa­chine, 2008 com­mis­sioned by Liv­er­pool European Cap­it­al of Cul­ture, described by The Observ­er as, ‘the biggest, most spec­tac­u­lar piece of street theatre ever seen in the UK’. She also com­pleted Mask, a multi-media col­lab­or­a­tion at The Con­tact Theatre, as part of Manchester Jazz Fest­iv­al in 2009 with moving image artist Mark Camer­on Minard and her band ‘Unfurl’. Olivia has recor­ded with pro­du­cer Tony Remy for sax­o­phon­ist Jean Toussaint’s album ‘Nazaire’ (All­tone 2000). She fea­tures on Kirsty Almeida’s ‘Pure Blue Green’ (Decca 2010), Zoe Kyoti’s “Wish­ing Bone”, Jadid Ensemble’s “Sigh of the Moor”, Kefaya’s “Radio Inter­na­tion­al”, “Seam­ing” by Seam­ing To and Fiona Nehama Abrahami’s ‘Random Excess’ (Music­Womb 2009). Olivia released her own album ‘Amoghasiddhi’ in 2008. Owl by the Owl Ensemble in 2011 and Arca­dia by Unfurl in 2012. As usual Moore’s com­pos­i­tions were exuber­ant and poignant affairs; each sec­tion of music acting like mini­ature vign­ettes. This is music that is intric­ate and yet cap­able of telling a uni­ver­sal story, what that story is, is prob­ably very dif­fer­ent to each listen­er, but it is this abil­ity to con­jure vivid imagery that makes it hugely access­ible. her obvi­ous joy in play­ing swells through her impas­sioned but restrained violin and offers her audi­ence both an emo­tional and a cereb­ral ful­fil­ment.